When it comes to dental care, that of dogs often gets overlooked. Part of the reason for this is that dogs don’t like being fooled with in the mouth area unless you are playing with them or they are eating! Using treats to clean teeth is an alternative to brushing and it can also help bridge the dental care gap between cleanings at your vet or the occasional brushing you may get in. Dentastix and Greenies are two of the most popular choices when it comes to canine dental chews. Making the choice may not be so easy if you just see them at the store. Scout is going to compare the two so you can decide more easily what is best for your dog. It is worth noting that all the dental chews discussed in this post have been shown to be effective in reducing plaque, tartar, and bad breath from your canine family members. The differences lay in ingredients and price point. 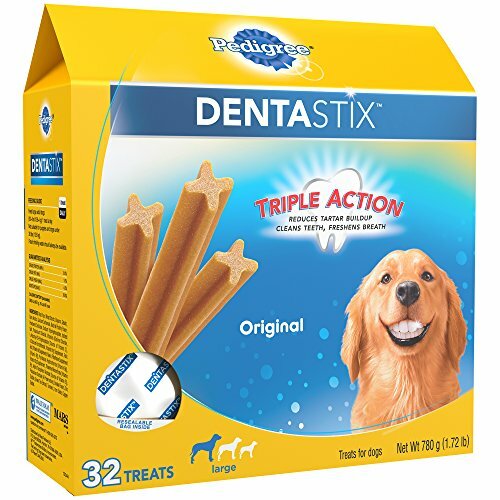 On average, a 32-pack of Dentastix sells for around $12 and weighs in at 1.72 lbs. Both Dentastix and Greenies come in different sizes. The regular or large size is suitable for a lot of dogs though but if your dog is really small or you have multiple dogs of different sizes you can always break a chew in half and give it to a smaller pooch. Both Dentastix and Greenies come in a variety of flavors and formulas. Greenies offers a hip and joint version for example. This post is comparing just the regular and grain-free varieties of each brand. Rice Flour, Wheat Starch, Glycerin, Gelatin, Gum Arabic, Calcium Carbonate, Natural Poultry Flavor, Powdered Cellulose, Sodium Tripolyphosphate, Iodized Salt, Potassium Chloride, Vitamins (Choline Chloride, L-Ascorbyl-2-Polyphosphate [Source of Vitamin C], d-Calcium Pantothenate, Vitamin B12 Supplement, Vitamin A Supplement, Niacin, Riboflavin Supplement [Vitamin B2], Pyridoxine Hydrochloride [Vitamin B6], Vitamin D3 Supplement, Thiamine Mononitrate [Vitamin B1], Folic Acid, Alpha Tocopherol Acetate [Source of Vitamin E]), Potassium Sorbate (A Preservative), Smoke Flavor, Zinc Sulfate, Green Tea Extract, Turmeric, Iron Oxide Color, Copper Sulfate. 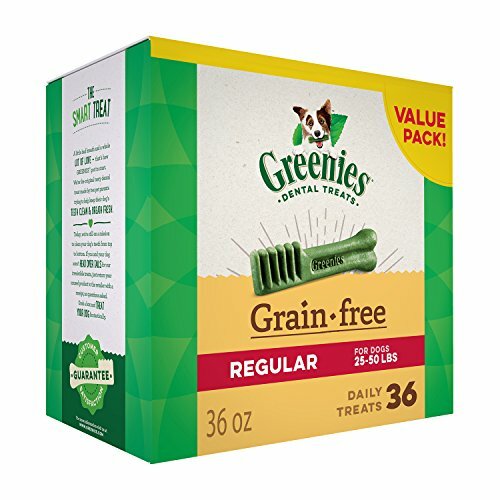 While Greenies offers more protein, I try to stay away from treats and foods designed for my dog that have a lot of wheat, corn, or soy in them. What I do like is that they do not have any artificial colors, flavors, or animal digest. The Pedigree Dentastix are also free of these ingredients and contains rice as the first ingredient which is one of the only grains I feed my dogs. From my perspective, the Dentastix offer a much better value and price point than the Greenies. Dentastix has fewer calories per treat too, which may be relevant if you are trying to watch your dog’s weight. Greenies do offer a grain-free version of their chews for a little more money. These are made with Chickpeas and Potatoes rather than wheat! 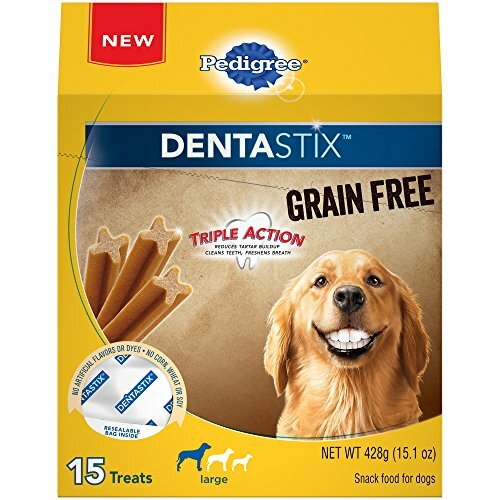 Pedigree Dentastix also have a grain free version made with Chickpeas and Potatoes. Potatoes, Chickpeas, Glycerin, Tapioca Flour, Pea Starch, Gelatin, Natural Poultry Flavor, Calcium Carbonate, Sodium Tripolyphosphate, Iodized Salt, Potassium Chloride, Vitamins (Choline Chloride, L-Ascorbyl-2-Polyphosphate [Source Of Vitamin C], D-Calcium Pantothenate, Vitamin B12 Supplement, Folic Acid, Vitamin A Supplement, Niacin, Riboflavin Supplement [Vitamin B2], Pyridoxine Hydrochloride [Vitamin B6], Vitamin D3 Supplement, Thiamine Mononitrate [Vitamin B1], Alpha Tocopherol Acetate [Source Of Vitamin E]), Potassium Sorbate (A Preservative), Smoke Flavor, Zinc Sulfate, Turmeric, Green Tea Extract, Iron Oxide, Copper Sulfate. Dentastix is still more affordable than Greenies but each treat does have less calories. 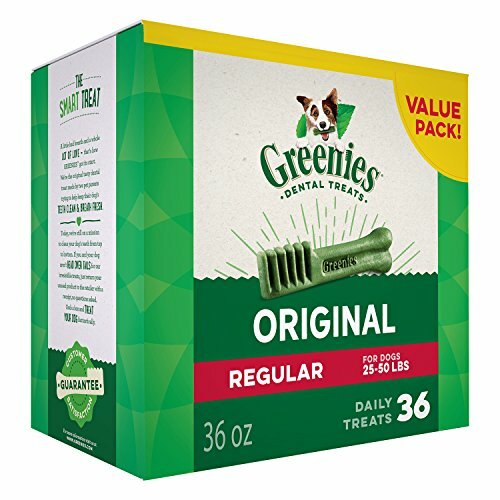 Greenies has a whopping 138 calories per treat compared to the Dentastix at 97 calories. The ingredients are not that much different, although one distinction is that the Greenies contains apple which could be a bit more appealing to your dog due to the sweetness. Of course this may also be part of the reason why the calorie content is so much higher. Dental health is important. While we know that getting your dog to let you brush their teeth may be close to impossible, there are some other things you can do to help reduce the amount of tartar and plaque on your dog’s teeth. Keep chews around. They don’t have to be food either. Chewing helps reduce plaque and tartar but you may not always want your dog to be eating something. Check out our post on The 10 Best Dog Bones for Power Chewers for a few options. There are liquids you can add to your dog’s water to keep breath fresh and reduce plaque and tartar. These are usually sold in bottles like mouthwash, and you add a cap or two to your auto-watering device. These additives also help keep the water bowl fresh and clean. SynergyLabs Dental Fresh Original Formula, 32oz. Feed your pooch hard kibble most of the time; the crunchiness of kibble helps dogs maintain cleaner teeth. I know dogs love wet food, but if they can eat dry at least part of the time it is better for their dental health. Anything you do to help your dog’s dental health is great. You don’t have to brush their teeth daily but it is good to do a few of the things talked about in this post. Scout hopes that you have decided to take doggy dental care more seriously and that your dog enjoys some great treats!